Here’s an outfit with a poncho! The poncho is actually new but here the leather jacket and bag are second hand. I also customised the Navy Blue scarf by adding a label from second hand. I like the layer on layer effect. 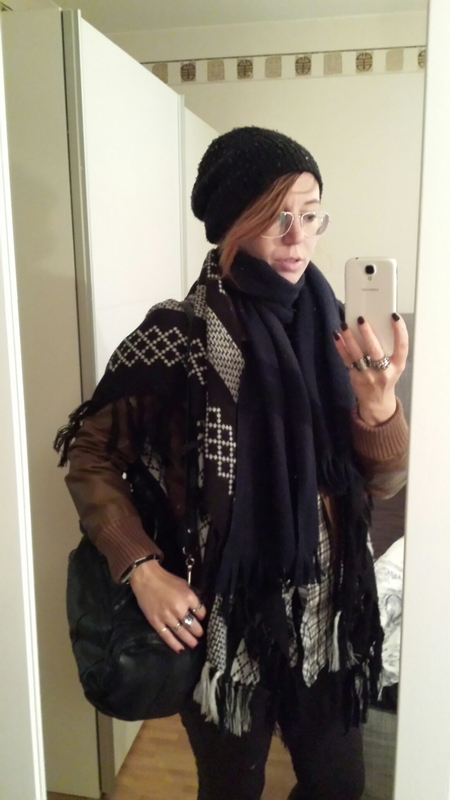 En poncho outfit där jacka och väska är second hand. Halsduken moddade jag genom att sy på en annan etikett. The vest is second hand from the Swedish Ebay and I love it. Paired with a nursing blouse also from Swedish Ebay. 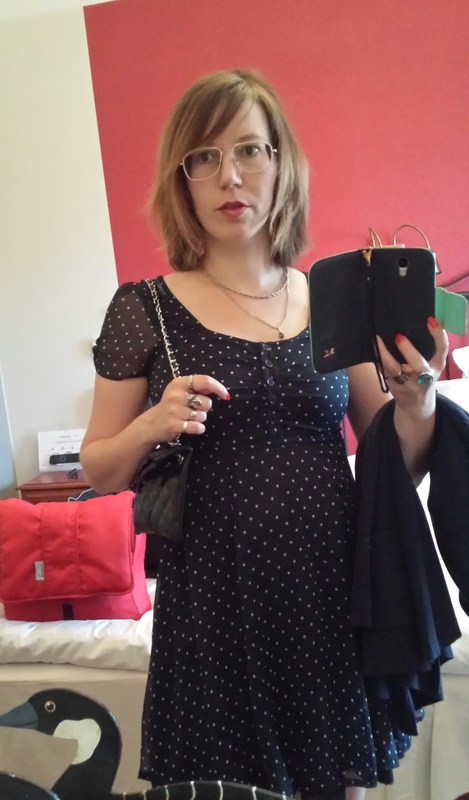 Another wonderful dress I have got second hand! //Ett härligt second hand fynd! Another second hand find its this checked black and white shirt! So lovely to combine with a pair of skinny jeans, boots and a leather jacket. Have you seen a Danish series called Rita? Well, that’s the favorite outfit of the main character! The jeans are also a second hand find as I don’t buy new jeans for environmental reasons. If you are in Uppsala you have to visit Myrorna outlet. They truly have a great concept where they have general prices, I believe thrift stores should be like that! Simple and cheap. 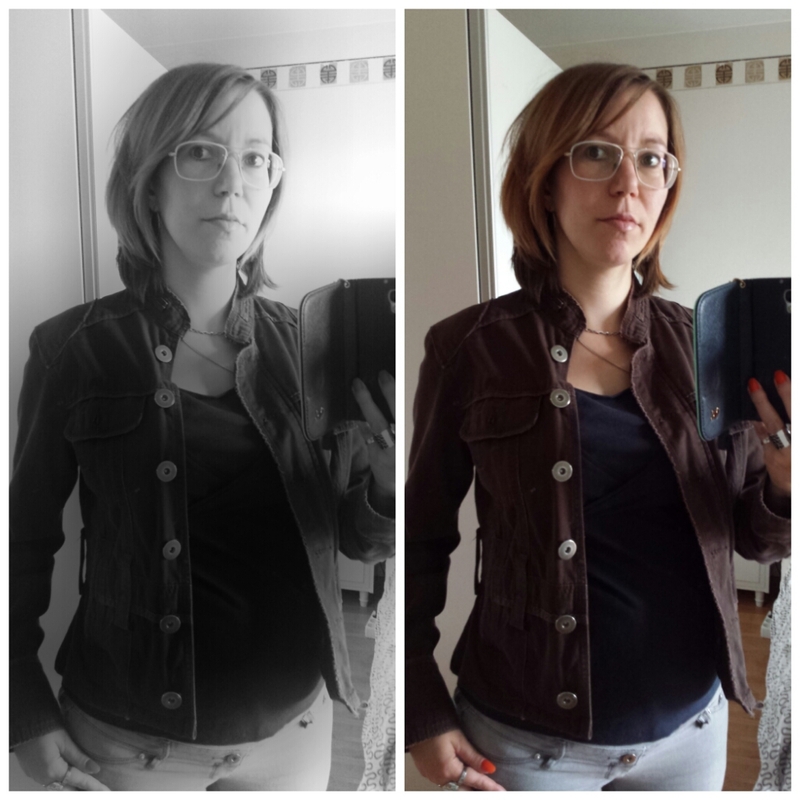 En outfit inspirerad av Rita med en svartvit skjorta och tajta jeans. Jag måste tipsa om Myrorna outlet i Uppsala. Det är en fantastisk butik, det finns mycket jeans och skinnjackor och priserna är generella, tex alla jeans kostar 40 kronor. Enkelt och bra! This is a swapped brown jacket, great for autumn isn’t it? En jacka från ett klädbyte, perfekt för hösten! A perfect shirt for a casual outfit. Second hand as well as the jeans. The top is from HM conscious collection. //En jeans skjorta som är köpt second hand precis som jeansen. Linnet kommer från HM conscious collection. 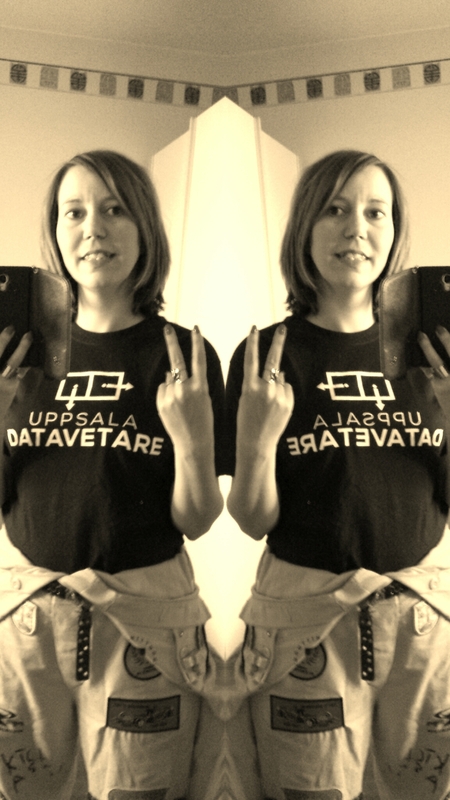 Mina senaste outfits med “Uppsala datavetare” t-shirt från Pollacks där jag läser datavetenskap. // My latest outfits with the computer scientist t-shirt från Pollacks where I study computer science! 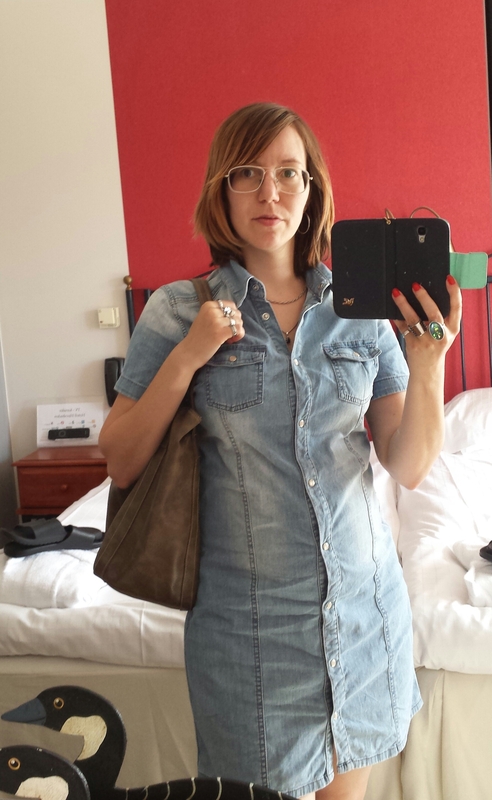 My denim dress in action, just with an oversize bag, perfect for a weekend getaway. 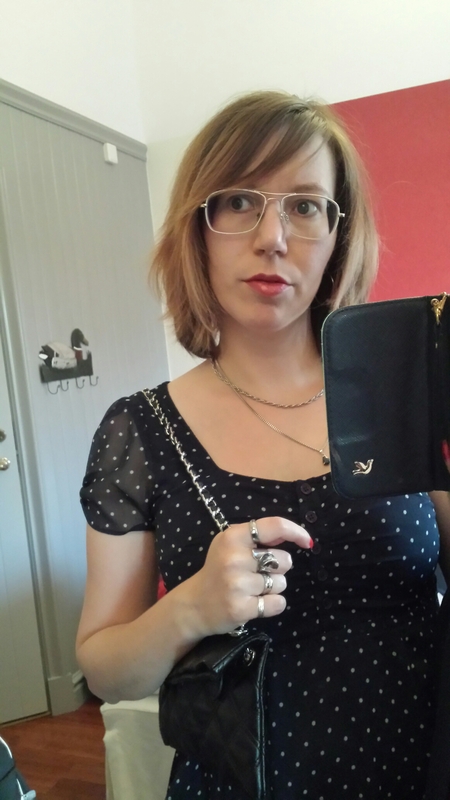 The dress is from Social ekonomi in Uppsala. Jeansklänningen från Social ekonomi in action. Perfekt tillsammans med en oversize väska! 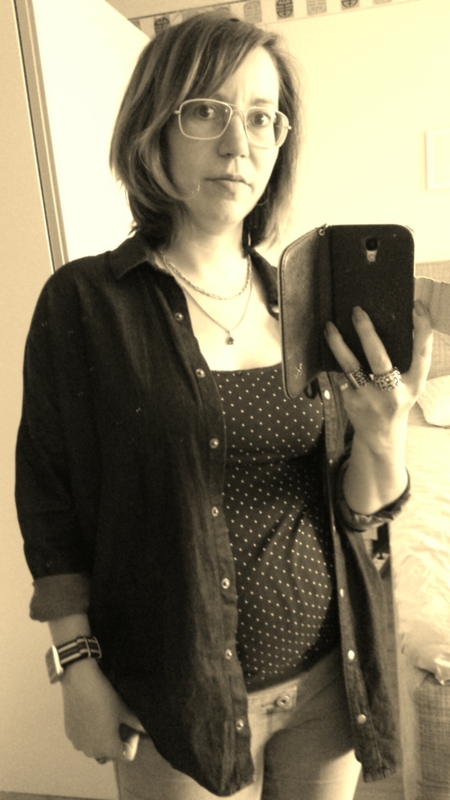 After pregnancy outfit! 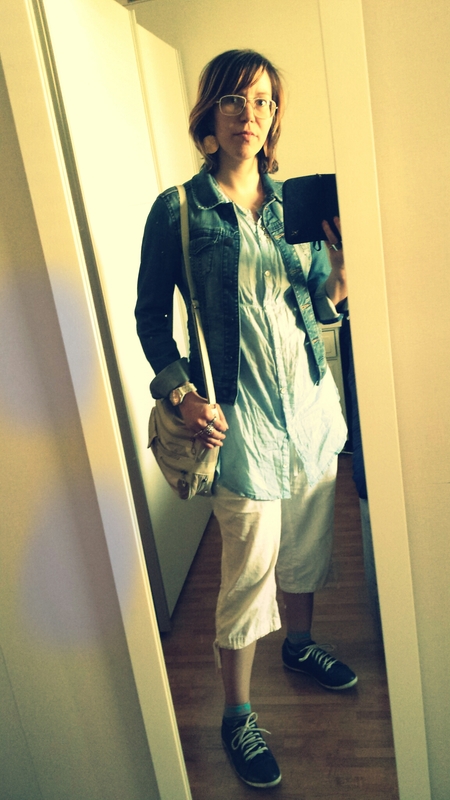 Shirt and pants are second hand. The outfits are mostly practical right now and there’s not much time to choose outfits! 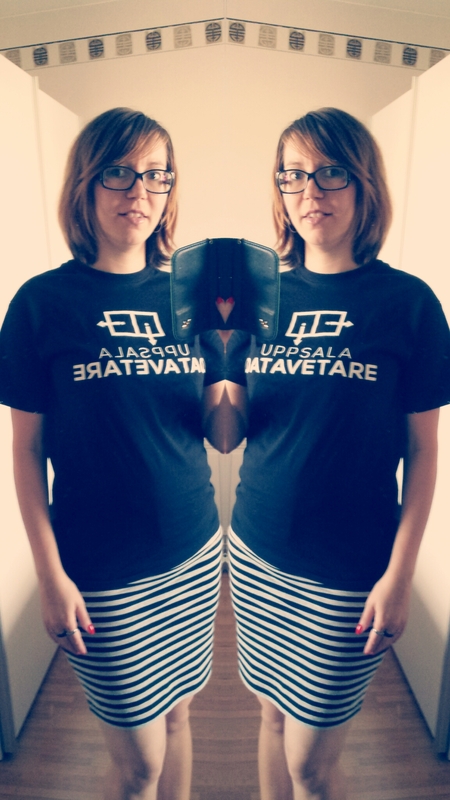 // Outfit från efter graviditeten. Skjortan och byxorna är second hand. Just nu är den praktiska sidan viktigast och tiden räcker inte till för att hitta bra outfits.